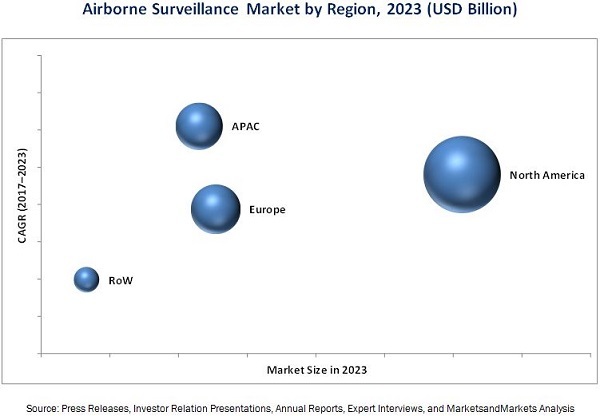 [162 Pages Report] The overall airborne surveillance market is expected to be worth USD 4.23 Billion in 2016 and is expected to reach USD 5.81 Billion by 2023, at a CAGR of 4.7% during the forecast period. The base year considered for the study is 2016, and the forecast period considered is 2017–2023. This report provides a detailed analysis of the airborne surveillance market based on type, product type, application, and region. The report forecasts the market size, in terms of value, for various segments with regard to four main regions—North America, Europe, APAC, and RoW. It strategically profiles key players and comprehensively analyzes their market rankings and core competencies, along with detailing the competitive landscape for the market leaders. The research methodology used to estimate and forecast the airborne surveillance market begins with capturing data on key vendor revenues through secondary research. Secondary sources used for this research study include government sources, corporate filings (such as annual reports, investor presentations, and financial statements), and trade, industry news, and associations. The bottom-up procedure has been employed to arrive at the overall size of the airborne surveillance market from the revenues of key players for different types of airborne surveillance systems in the market. After arriving at the overall market size, the total market has been split into several segments and subsegments, which have been verified through primary research by conducting extensive interviews with people holding key positions in the industry such as CEOs, VPs, directors, and executives. The data triangulation and market breakdown procedures have been employed to complete the overall market engineering process and arrive at the exact statistics for all segments and subsegments. The breakdown of the profiles of primary respondents has been depicted in the below figure. The airborne surveillance market comprises a network of players involved in the research and product development, raw material suppliers, manufacturers, OEMs, investors, and distributors. Players operating in the airborne surveillance market include Airbus (France), Boeing (US), Saab (Sweden), BAE Systems (UK), Raytheon (US), Lockheed Martin (US), Leonardo (Italy), FLIR Systems (US), Northrop Grumman (US), L-3 Wescam (Canada), Leica Geosystems (Switzerland), Teledyne Technologies (US), Safran (France), Thales (France), and Israel Aerospace Industries (Israel). End users of airborne surveillance systems across various industries such as military and commercial applications. The military segment applications are ISR and targeting, search and rescue, law enforcement, border surveillance. The commercial applications are engineering, surveying, and mapping, inspection and monitoring, agriculture and forestry, exploration, insurance, education sector, healthcare and delivery and logistics. This research report categorizes the airborne surveillance market on the basis of type, product type, application, and region. The airborne surveillance market is expected to be valued at USD 4.42 Billion in 2017 and is expected to reach USD 5.81 Billion by 2023, at a CAGR of 4.7% during the forecast period. 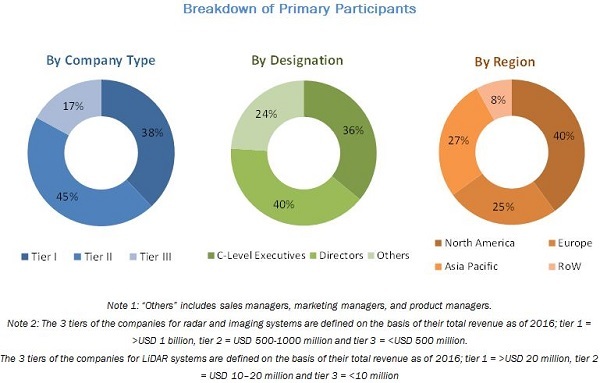 The growth of this market can be attributed to the availability of low-cost UAVs, the growing use of UAVs in commercial applications, amendments in laws, and rapid technological advancements. The airborne surveillance market has been segmented, on the basis of product type, into manned system and unmanned system. The airborne surveillance market for unmanned system is expected to grow at the highest rate during the forecast period. The growing use of unmanned systems has been observed in both military and commercial applications. Unmanned aerial vehicles have always relied on already developed aviation technologies to meet their relatively modest performance criteria. Today’s UAVs employ the latest sensor and communication technologies to deliver a capability. Different military unmanned systems or vehicles include high-altitude long-endurance (HALE), medium-altitude long-endurance (MALE), tactical, strategic, and others. For military unmanned systems, major demand is derived from radar and imaging systems, while for commercial unmanned systems, major demand is derived from LiDAR and imaging systems. Drones are now being used with laser scanners, as well as other remote sensors, as a more economical method to scan smaller areas. Drones are now updated with LiDAR technology for a variety of applications such as agriculture, mining, surveying, forestry, and monitoring. North America is expected to account for the largest share of the airborne surveillance market during the forecast period. The market in North America has been further segmented into the US, Canada, and Mexico, and is dominated by manufacturers such as Boeing, Lockheed Martin (US), Raytheon (US), and BAE Systems (US). Countries in North America, mainly the US, have a huge defense budget as compared to Europe or APAC, thus leading to the increasing demand for airborne surveillance systems in North America. The US is expected to be the major contributor to the airborne surveillance market in North America. The presence of major players in the US is expected to drive the airborne surveillance market growth in this region. Also, the relaxation in regulations in Mexico has led to the increase in research and development for drones and UAVs in the country. Owing to the amendments by the FAA and the US government, it has raised an interest for the companies to invest in drones and UAVs in the US. The production of UAVs is expected to increase in the next few years, as amendments in rules allowed the commercial use of drones in 2016. Since August 2016, the FAA has approved more than 300 waivers for the use of drones in many places/locations. Major players in this market include Airbus (France), Boeing (US), Saab (Sweden), BAE Systems (UK), Raytheon (US), Lockheed Martin (US), Leonardo (Italy), FLIR Systems (US), Northrop Grumman (US), L-3 Wescam (Canada), Leica Geosystems (Switzerland), Teledyne Technologies (US), Safran (France), Thales (France), and Israel Aerospace Industries (Israel). Figure 16 The Availability of Drones at Lower Cost and Improved Laws Have Been A Major Driving Force for Airborne Surveillance Market.